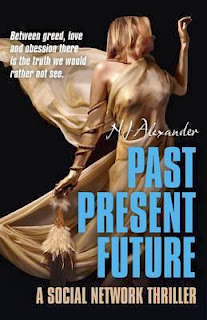 N.J. Alexander, Past Present Future: A social network thriller. Roundfire Books, 2013. Pp. 309. ISBN 978-1-846949-70-8. $20.95 / £11.99. N.J. Alexander’s “social media thriller,” Past Present Future is both fascinating and frustrating. What fascinates: set in the UK, in 2008, against the backdrop of the beginnings of a global recession and the rise of Facebook and Twitter, Alexander’s novel reveals our worst fears about the economy and technology. What frustrates: most of the book’s most thrilling moments occur online, as the protagonist, Nicole, reads the Facebook messages of Anthony Hope, a moderately successful American singer and former co-worker who may—or may not—be stalking her. Alexander has a talent for blending classic surreal imagery with an exploration of the dangers of modern technology, and readers will enjoy how many of Anthony and Nicole’s Facebook posts reference Lewis Carroll’s Alice in Wonderland. Still, despite this psychological tension, I wanted to see more of these characters, particularly Nicole, in real life. In other words, while I love that this book pays so much attention to our virtual lives, the problem with having few in-person moments is that it becomes difficult to understand Nicole and Anthony’s characters. Readers will recognize, for instance, that we present a more glamorous image of our online lives, that our Facebook pages omit or downplay moments that show us as less than clever, witty, or strong. So, every time Anthony posts to his Facebook page, it’s hard to figure out if he’s sending Nicole a veiled message (this is her belief) or if it’s just an innocuous coincidence. And, without real-life action, the reader views Nicole and Anthony as online strangers, not as actual friends we care about, and it becomes hard to understand or sympathize with either of them. 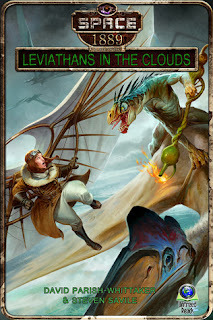 Steven Savile & David Parish-Whittaker, Leviathans in the Clouds. Untreed Reads, 2013. Pp. 90. ISBN 978-1-6118756-7-6. $2.99. And so it is ho! for adventure in the skies and on the boggy wetlands of Venus. Space 1889: the small, but cheerfully championed, series of novellas based on the premise of a classic role-playing game have entered their second season, continuing the cross-solar system exploits of Nathanial and Annabelle. Fundamentally a sequence of steam-punk escapades in outer space, told with the enthusiasm of Boys’ Own serials, the stories are fun escapism for anyone who likes a cheerfully outlandish alternate history premise, served with dollops of action.